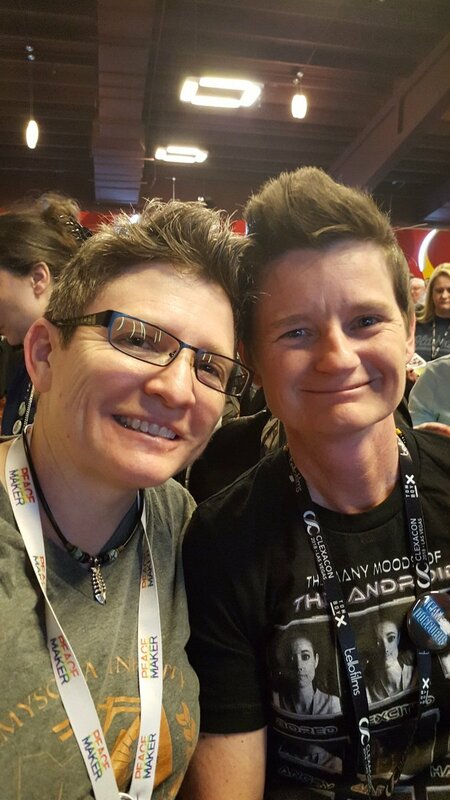 I just returned from ClexaCon and it was wonderful to be immersed in a LGBTQ themed con. Such a passionate and friendly environment with the guests that shared their love of fandom and community issues. Whether gay or straight, there were so many words of love and encouragement that touched so many lives. The world needs more of this. While I certainly loved meeting guests, attending panels, learning the game of Craps, and catching up with old friends, I was also excited to meet a few new folks from Twitter land, fellow fangirls and authors, Andi Marquette and Virgina Black. 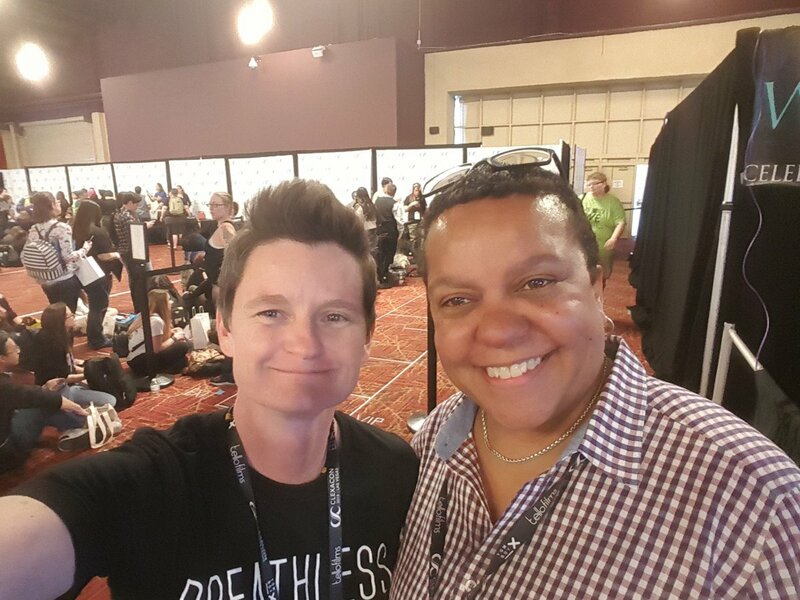 If you missed it, be sure to check out @Clexacon on Twitter or their homepage. There are plenty of panel videos for you to indulge in. If you did attend, I’d love to hear what you favorite memories are. In other news, I have posted a few more excerpts from my WIP over the last two weeks. If you’ve read them, I’d love to hear your thought. I hope to release more soon. Now, on to the main event…This month I host an author with such a diverse background, that I challenge you to find one that tops her. Her vast experiences and passions are present in her novels. Everyone can find something to love about R J Samuel. She also has two upcoming events: You can meet RJ at the Rehoboth Women’s Fest on Friday April 13, 2018 in Delaware where she will be reading from her latest novel. Or, in Asheville, NC on Memorial Day. So without further ado, time to meet our guest. R J, you have a diverse background. How did you get started writing? For many years I wrote technical documents in my work and I helped friends and partners with their college writing. I never thought of myself as particularly creative. I took a writing class and that confirmed some of my niggling fears. I went to France and lived through a very difficult time and when I returned to Ireland, I decided to try creative writing classes again. This time I ended up in a class with an amazing teacher and group of students who became friends and we followed this teacher through as many classes as we could and then formed a writers group. One day in a café after a class, we wrote out what we were going to do that year and put it on small slips of paper into a bag and many of us promised ourselves and that paper that we would write a novel. Six months later, I published my first novel, Heart Stopper. In my cultural background I have been most influenced by being an outsider who has been given partial entry in to groups in that I am usually accepted but rarely fully belong as I can’t ‘unsee’ what the outsider sees of these groups and I can’t ‘unfeel’ what those who still remain outsiders to these groups feel. I have developed the habit of observing from the inside out. It restricts my audience in a way as it feels sometimes like writing to a niche of one or two, I mean how many other Irish-Indian lesbians with a similar background do we know…but the almost universal experience of ‘not belonging’ somewhere resonates with my readers as we are almost all painfully aware of some feature of ourselves that does not fit in with the majority. I hope my writing also stands out because I never take the well-trodden path. It makes me uncomfortable to tell a story that has already been told before (for some daft and poverty-inducing reason), so I take a lot of time and effort to find the unique angle. To the extent that I developed a possible new way to assassinate someone (in “Heart Stopper”) and I invented the concept of the Vision Painter in “Falling Colours” and had enough people asking if it was real that in “Casting Shadows” I developed the 200-year history of a profession that does not exist (but many, including me, would love to see exist). I also usually have twists that most readers do not see coming (I especially loved “Fingersmith” by Sarah Waters and took inspiration from that). My latest novel, “An Outsider Inside,” is a quilt of colors sown together from so many threads springing from my diverse background and my observation though that lens of culture, race, sexuality, gender, and identity. That it is created in a novel with mystery and thrilling suspense, love stories and family love, is due to the influence of my background as an avid reader of fiction like that. The flow, when it is there. In the past I described my process as that of a train ride – I decide that I’m going to take a journey, I pick my departure and destination and construct a railway line with stations along the way. I create the scenes as compartments of the train. I invite the characters on the journey and give them the freedom to be themselves within the compartments. They can have a riotous party or they can talk quietly amongst themselves. There are times when I’ve caught them running along the roof of the carriages whooping and hollering, but ultimately we all remain on the train and it is up to me to keep them on board and get to the destination. Now my writing process is more like wandering around a deserted attractions park and trying out the rollercoaster and house of mirrors and teacup ride 😊. Sometimes the excitement is there and the story rushes out and other times I’m twiddling my thumbs while gently turning in circles 😊. When I was reading fiction, I guess I’d say psychological thrillers (for a period of time) with an occasional dip into literary fiction or whatever genre it is that books by Sarah Waters and Arundhati Roy or Alice Seybold fit…In non-fiction, self-improvement, personal growth, craft of writing. What books are you reading now, or are on your to-read list? I haven’t been able to read fiction for almost 5 years now. I read a lot of non-fiction – books on writing, self-development, personality. The last full book I read (listened to) was “Attached” about the science of adult attachment. I’m going to have to read or re-read books about narcissistic and borderline personality disorders for research for my WIP, and I’ll’ probably read a book I purchased months back but haven’t read, “From the Ground Up” about a food grower’s education in life and love, just to cleanse my mind and root my soul again. What writers do you look up to and why? Who has been your favorite character to write so far? I love all my characters. I couldn’t spend so much time with them and in their thoughts and feelings and cares and history without caring a great deal about them. Which is why it can sometimes be hard to write as I do put them through some awful times. In fact, I’ve been delaying on the third in the Vision Painter series because I have written 8 chapters based on an outline which pretty much destroys Kiran’s life (I wrote it from a dark place) and while it is a great story with so much potential to be riveting, I just can’t bring myself to do that to her. So I think I need to wait and get back into the mindset I was in when I wrote the first book in that series and come at it with that energy. I’ve changed though so it will probably still end up as a fusion of the energy of the two previous books, the more humorous, lighter air of “Falling Colours” and the more detailed, darker aspects of “Casting Shadows,” with the addition, of course, of the older and slightly wiser me I have become, both as a writer and a person. Almost a doctor, Masters in IT, writer, setting up and artist colony, world traveler…what else do you aspire to do or try? Actually did finish medical school and worked one year as an intern doctor before doing the Masters in IT and I owned and ran a restaurant/bar in the Southwest of France. I’m an unintentional world traveler as I am terrified of flying (which really did not help when I lived on a wee island off of Europe). My dream at the moment is to set up an artists retreat or an animal sanctuary or a nice place for older lesbians or a combination of all these spaces. I purchased and moved into (and am, unexpectedly, repairing) a house on 18 acres of land. I hope to teach writing and have all kinds of creative and healing practitioners run workshops here. I work fulltime in IT to pay the bills, but I would really like to earn a living (or really more than a cup of coffee 😊) from my writing. Take good creative writing classes and read lots of books on writing. You wouldn’t expect to be a professional in any other field without some attempt to learn the tools of the craft and from the wisdom of those who practice the art well. But seriously, I struggle with that and I can’t push myself now like I used to before. I wrote 4 novels in 2 years and then could not get one out if you paid me or to save my life…It took 3 years before my fifth novel, “An Outside Inside” came out and I am now exhausted and I think what I am doing now is being gentle on myself and re-fueling, with life, with other creative experiences, with gentleness and non-judgement. I plan to keep taking improv classes which I found greatly helped me in writing mostly through helping me as a person to expand my awareness of myself and my right to express myself as freely as anyone else. I’m struggling to write but I do have three novels outlined (and started). One is a standalone more contemporary romance than I’ve tried before, the other is the third in the Vision Painter series, and lastly, the ‘official WIP’ where most of what little creative writing energy I have is now focused, is a standalone psychological thriller about an agoraphobic travel writer whose life is turned upside down forcing her to confront her past and her justified fears. Would you like to offer up any food for thought? I encourage readers of lesbian fiction to read outside their comfort zone as much as possible. I did the same thing when I was reading fiction i.e. I went to my zone and read as much as I could of HEAs and genre formulas as this provided a happy and safe reading experience. I’m not criticizing those who do, we all need our comfort and safety. But this does not encourage writers to stretch themselves and to raise the bar for the genre and it does not reward those writers who do decide despite that to write outside the safe zone. I had to make a conscious decision, at the risk of not being as widely-read or financially rewarded, to stick to the stories that illuminate the reality of life as well as the romance of it. Our stories shape us. If we constantly and solely eat a diet of unrealistic stories, it can be confusing and dangerous when we wake up and wonder why we are unhappy and unsatisfied and have few or no defenses against the realities of life. R J Samuel considers herself almost Irish, almost Indian, and almost American. Born in Nigeria to Indian parents, she moved to Ireland in her teens. She spent many years qualifying to be a medical doctor first in Nigeria, then Ireland, but ran away from home to do a Masters in IT. She remained in Ireland for many years, apart from a few years in the southwest of France where she ran a restaurant-bar despite having absolutely no interest in restaurants, except for eating in them. RJ is the author of five critically acclaimed novels and her short stories have been shortlisted for international awards. Her latest novel, An Outsider Inside’ is described in Curve Magazine as ‘throwing down a time marker, because who you were before is not who you are when you’ve finished it’ and was named Best Lesbian Novel in 2017 by The Lesbian Review. She has twice been a finalist for awards voted on by readers, the Ann Bannon Popular Choice Award and the Tee Corinne Cover Design Award (in 2015 with her third novel, A Place Somewhere, and in 2018 with her fifth novel, An Outsider Inside) as well as two Rainbow Awards Honorable Mentions for her Vision Painter series (2014) and An Outsider Inside (2018). She now lives in Atlanta, Georgia, with her rescued dog, Piglet, and her ‘foster’ cat, Mushroom, where, in her latest creative outburst, she wants to establish an artist retreat in a mostly unusable property. Thank you, R J, for allowing us to get to know you better. I hope everyone will give your books a read. Stop by next month for a chat with the U.K. author, Clare Lydon. Very nice interview! Looking forward to next month.